The rotator cuff is a group of 4 tendons in the shoulder joint, which offer support and range of motion to the arm. Injuries to these tendons can cause rotator cuff tears. There are two types of rotator cuff tears: acute and degenerative. Degenerative tears are a common problem for aging populations given the poor blood supply to this area. Acute tears are more common in younger, athletic people or in people who suffer trauma to the shoulder. Overhead weight exercises, throwing exercises, and motor vehicle accidents are some common causes of rotator cuff injuries. Injuries of this sort can cause moderate to severe pain, particularly at night, limited range of movement, a sensation of catching when moving the shoulder joint, in addition to swelling, stiffness, and tenderness in the shoulder. The specific symptoms and severity of pain depend on the type of injury and whether or not there are any complicating factors, like age, arthritis, etc. Dr. Patel will be able to diagnose the injury based on the rotator cuff symptoms. In order to diagnose the specific sort of injury endured by the shoulder, Dr. Patel will typically start with x-rays, and then order an MRI, ultrasound or sometimes a CT scan. If the injury is not severe, treatment may be limited to rest, ice, anti-inflammatory medicine, steroidal injections, and physical therapy. However, in many cases rotator cuff surgery will be necessary in order to return the shoulder joint to a healthy functional state. 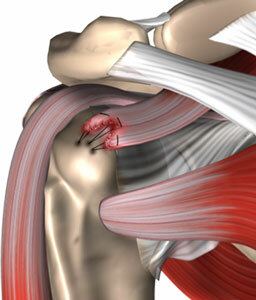 Rotator cuff surgery is performed using an arthroscope. This is a fiber optic tool with an attached camera which Dr. Patel will use to visualize the injured region of the shoulder. This technology has made for advancements in shoulder surgery. In the past large incisions were made to perform the operation. This is called an open shoulder surgery. Many doctors opt for this procedure because it is quicker and easier for them, but typically causes more pain and a longer recovery time to the patient. Given specialized training in minimally invasive surgery, Dr. Patel prefers arthroscopic surgery. Arthroscopic surgeries can be accomplished by making very small incisions that leads to less pain and less scar tissue. In rotator cuff surgery the injured tendons will be repaired using suture anchors. These aid in re-attaching the tendons to the bone. Furthermore, Dr. Patel specializes in procedures to repair and reconstruct massive rotator cuff tears or chronic rotator cuff tears that may be deemed irreparable by other doctors. These surgeries are also done arthroscopically. Recovery time for rotator cuff surgery depends on the severity of the injury and the complexity of the operation. Typically, patients can expect to be in a sling for about 4-6 weeks. Once that is removed, patients will be able to return to driving. Dr. Patel will recommend physical therapy during this recovery period and specific rotator cuff exercises to return mobilization to the shoulder joint. Patients who undergo arthroscopic surgery should begin to see improved flexion within 1-2 months. A return to competitive athletics or heavy physical labour will be possible about 3-4 months after rotator cuff surgery.